Mediterranean Quinoa Salad Recipe – Gluten Free! 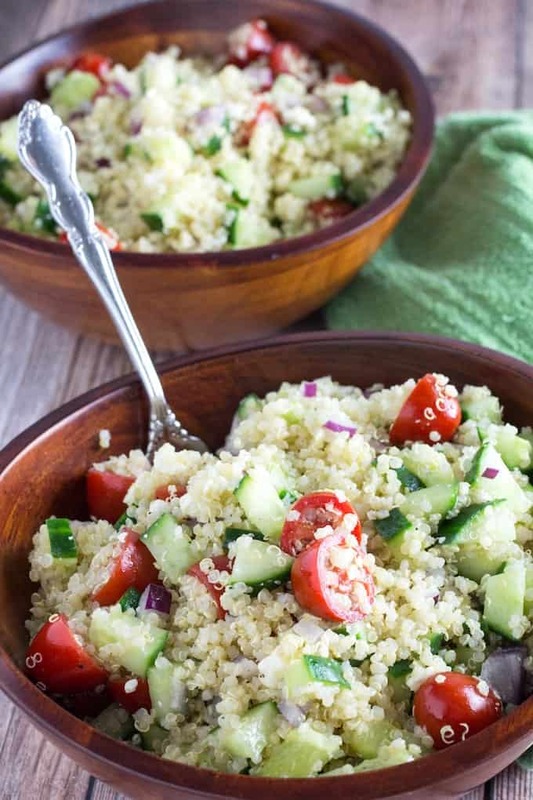 Mediterranean Quinoa Salad Recipe is a really quick, simple, and healthy gluten free salad. It’s packed with protein and veggies like cucumber, tomato, and onion, along with Kalamata olives and feta cheese. It’ll be your new favorite salad! I have a new love in my life, and it is this Mediterranean Quinoa Salad Recipe. 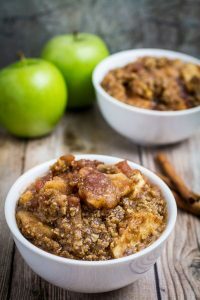 It’s super simple to make, all you have to do is add some chopped veggies to cooked quinoa, season, drizzle with olive oil and lemon juice, and boom. Perfect side dish for a healthy dinner. Quinoa is actually really easy to make. If you’ve never made it before, you should think of it a lot like rice. All you have to do is add 1 cup of quinoa, 2 cups of water, and a dash of salt to a pot. Bring it to a boil, lower the heat to a simmer and cover the top of the pot (leave a little bit open to vent). After about 10-15 minutes, remove cover and stir. 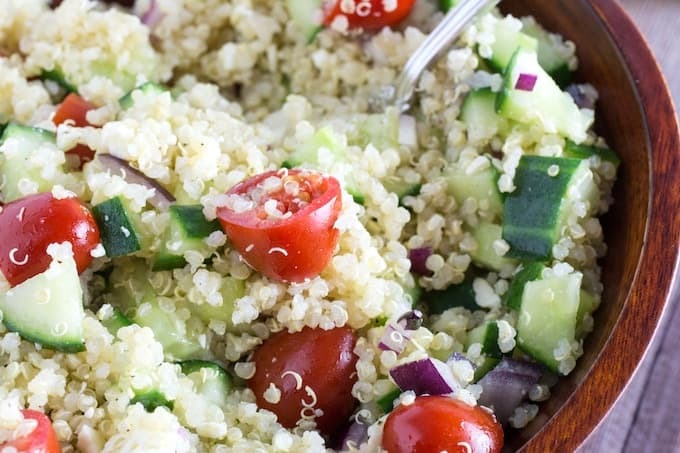 If all of the water is gone, fluff the quinoa up with a fork and you’re done! And you can add more or less, depending on what you need for a recipe. You can also play with the flavor of quinoa a bit by adding different flavors to the water. I’ve added broth and spices, mix it up depending on what dish you’re making. There’s a lot of great mediterranean flavors going on here. The tomatoes and feta cheese, along with olives and olive oil. 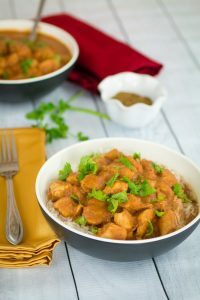 It’s really delicious, and goes well with a lot of different proteins. Quinoa itself has protein if you want to keep this vegetarian, or add some firm sautéed tofu. I love to serve this with grilled chicken or steak on top, to add some extra flavor. Plus, it makes this mediterranean quinoa salad recipe feel like more of a complete meal to me. I hear this question a lot, and the simple answer is yes. Quinoa itself is gluten free. In fact, it’s a great alternative to other gluten-containing grains! And it provides some much-needed nutrients to the typical gluten free diet. The one thing you should watch out for, though, is how the quinoa is processed. 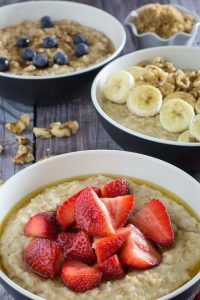 You want to treat this one a lot like oats. On a factory level, the grain can be cross-contaminated with gluten-containing grains. To be sure your quinoa is gluten free, double check that it has the certified gluten free symbol on it, just to be safe! If it does, then it’s all good! 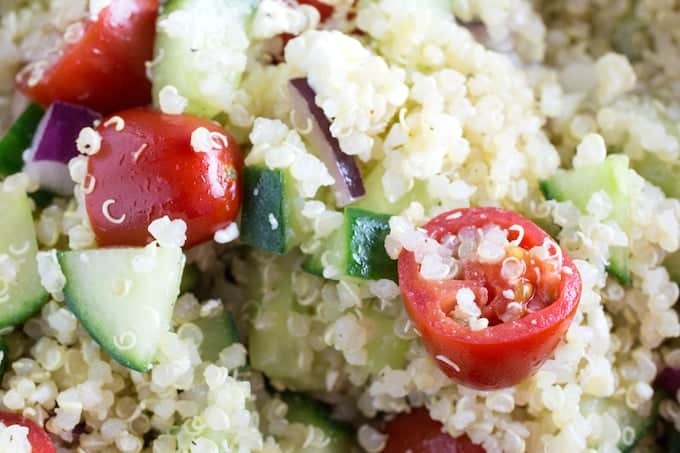 Love This Mediterranean Quinoa Salad Recipe? Check These Out! 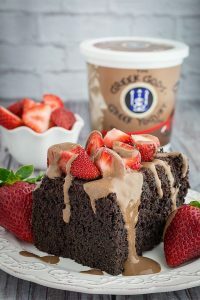 Greek Salad Dressing & Greek Salad – Sticking with the mediterranean flavors, this will be your new favorite salad dressing! 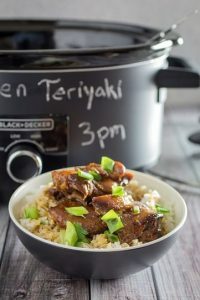 One Pot Greek Lemon Chicken & Rice – This is a more savory dish that has super flavorful chicken on top of rice, and all in one pot! 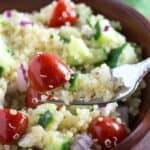 Cucumber Tomato Avocado Salad – You could add quinoa to this one, too! 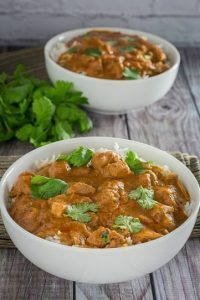 It’s super fresh and quick to make. 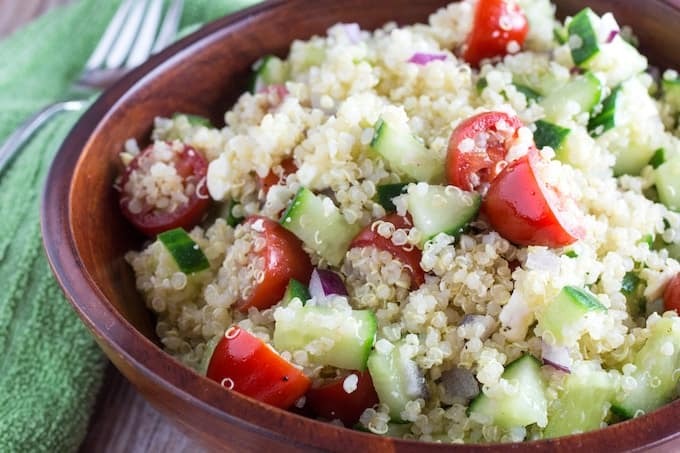 Mediterranean Quinoa Salad - Gluten Free! 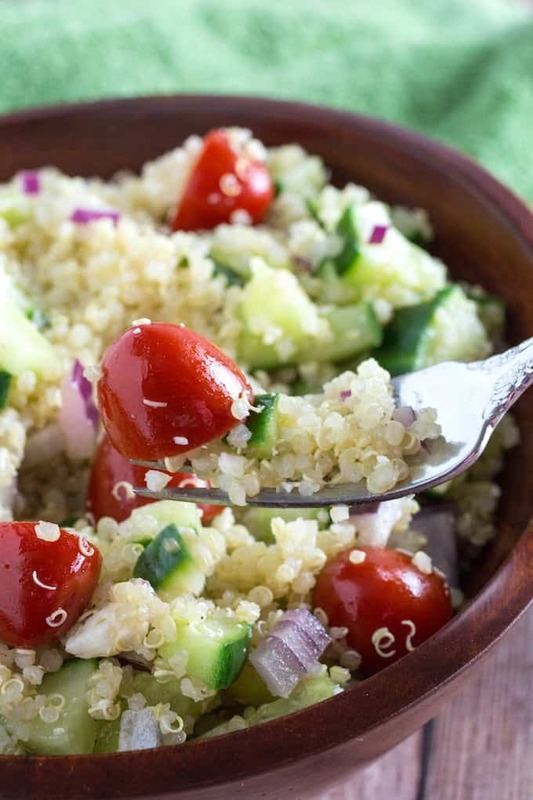 Mediterranean Quinoa Salad Recipe is a really quick, simple, and healthy gluten free salad. It's packed with protein and veggies like cucumber, tomato, and onion, along with Kalamata olives and feta cheese. It'll be your new favorite salad! 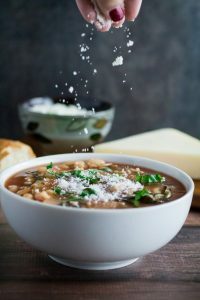 Mix all ingredients together in a bowl and stir to combine. 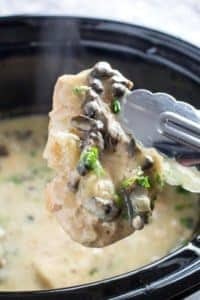 Chicken Broccoli Alfredo Bake - Gluten Free!